Rich in resources for healing. Cutting-edge information and great prose. Whoever the reader, no matter their medical crisis, this book addresses their needs in a forthright, pro-active manner. If it's about Latino Liver Awareness or Superior Canal Dehiscence, or even managing emotional and various health problems throughout the family, you'll find terrific resources here. 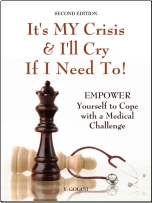 Readers and loved ones sharing this book can become pro-active in making dignified, productive responses to the challenges of medical and emotional crises. -	The spiritual content is universal. -	Coping mechanisms in the book are safe, sound, you-can-do-it strategies. "She's Jewish and I am Christian, but the importance of the spirituality in It's MY Crisis! was incredibly accurate." "The hardest part of any crisis is the worry and fear that accompany it. This life-saving workbook will help you direct your thoughts in positive, constructive ways that will make a big difference for you and your loved one. It's a lantern in a dark night from someone who's 'been there, done that.' And if you follow its suggestions, you'll likely come through the crisis better, not bitter. It's filled with wonderful ideas." Ms. Golani's insightful and uplifting book guides us to confront illness in a multi-modal fashion. She advocates using all resources at our disposal-humor, creating a positive emotional environment, self-nurturing, friends, outside resources, medical and alternative practitioners-to fight illness. She gives excellent advice as to how we can build and preserve good morale, get help when we need it, stay organized with appointments, medication protocols, bills, and the like, prepare for hospitalization, and focus on our blessings and getting better. A significant portion of this 113-page book gives Resources. This includes contact information about organizations and treatment centers that deal with specific medical problems. It also includes abundant resources that most people wouldn't know how to find, including compassionate clowns, how to find an observant mental health professional, services for blind people, information about neurological disorders, where to get free medical care and medications, and where to enroll in clinical trials. In short, "It's My Crisis! does a masterful job offering the reader practical recommendations, emotionally-uplifting advice, medical resources, and spiritual guidance to face, and hopefully overcome, medical illness. In the process, she inspires us to transform ourselves into better spiritual and emotional beings. This book is a "must read" for everyone. Through her inspiring honesty, courage and strength, Yocheved shows us how the importance of a positive attitude and will to live are both essential to healing and recovery through all of life's challenges. This is a very well written, personal experience of an extraordinary individual. In spite of the medical crisis she found herself challenged with, she overcame her illness, her fears, and her diagnosis in spite of many in the medical profession, not because of them. The inspiration and determination of this woman through positive reinforcement and amazing faith has made her a medical miracle and a wonderful example to us all. If you have not read this book, it is a must read for all! Yocheved Golani has written a comprehensive manual for the ill and those helping the person experiencing a medical crisis. Her approach is compassionate and filled with messages of hope and universal faith. I found the book to be pro-active, not reactive. In Ms. Golani’s encouragement to use positive language, she enables a reader to look at their circumstance as a point of growth. She has productive exercises for the reader, using one’s own words to approach a medical crisis (or chronic illness) is going to last much longer than the “you should” messages so many ill people face. The list of resources is a valuable commodity! Whew, everyone experiencing illness should have access to this comprehensive list- it’s action oriented, for sure. Ultimately, the most endearing and enduring message one can receive from this book is: Medical crises may happen, but who you are, how you manage - it’s in your hands. Pick up this book and be your own best advocate! Yocheved faced a nightmare in 2005: a Petroclival Tentorial Meningioma crushing all her nerves where they entered her head from her spine. Surgery saved her. Yocheved's journalistic byline has appeared in several publications.